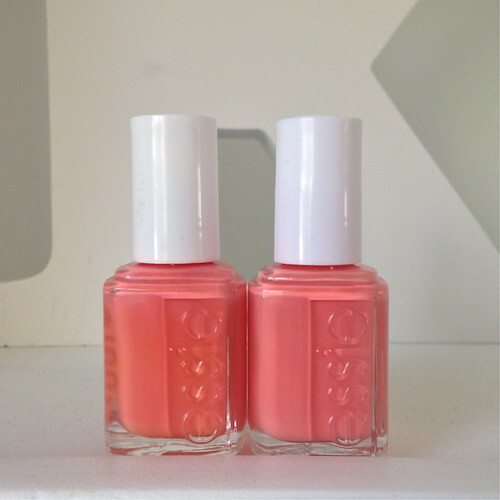 Ever since I posted my swatches and review of the Summer 2015 Peach Side Babe Collection, I've been wanting to dig through my Essie collection and do a comparison post. I also borrowed a couple of polishes from my friends @austrianjoseenails and @msbrightside_beauty to make sure I had all my bases covered. And I actually came up with a complete dupe! Let's get into the comparison. I actually didn't expect these two to be as close as they are. I really thought that Peach Side Babe was going to be a lot lighter than Tart Deco, but as you can see they are very close. Once I had them on my nails, I really had a hard time telling them apart. Tart Deco is still a bit darker but not as much as I expected. Both polishes applied really well, and were creamy and opaque in 2 coats. I had plans to compare Peach Side Babe to Haute as Hello as well but they weren't even close. Haute as Hello was quite a bit lighter and more orange. 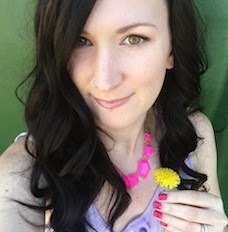 If you missed seeing my comparison of Peach Side Babe to Stones 'n' Roses check it out here. 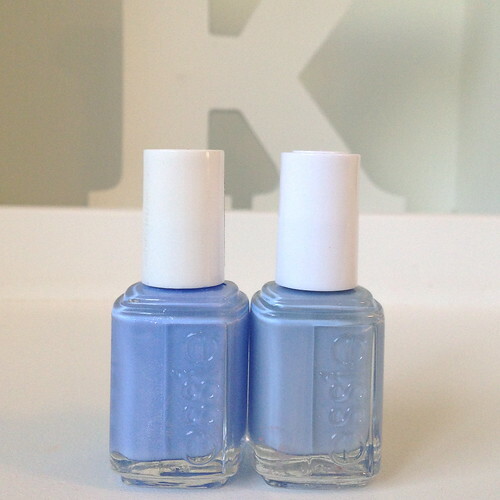 These two are pretty close but Bikini So Teeny is a bit more saturated in colour while Saltwater Happy is lighter. 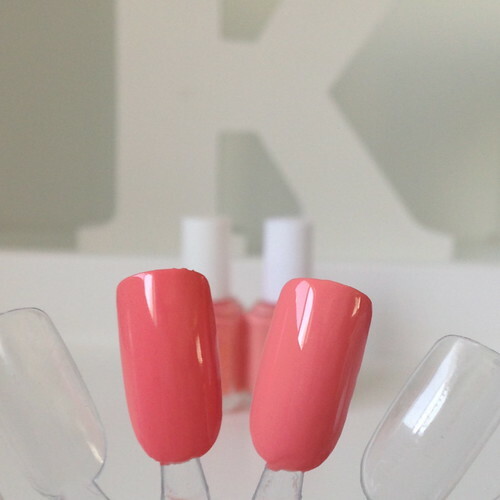 Bikini So Teeny also has micro shimmer throughout the polish and Saltwater Happy is a straight up creme. Between these two formulas, I much prefer Saltwater Happy. I know Bikini So Teeny is everyone's favourite summer polish colour, but as much as I think the colour is pretty, it is not a fun polish to apply. It drags and streaks so you need three coats to even it out. It doesn't self-level that well so it will still leave you with an uneven surface and you need topcoat to smooth it out. Saltwater Happy is much smoother and easier to apply and is good to go in two coats. *Updated June 12, 2015. 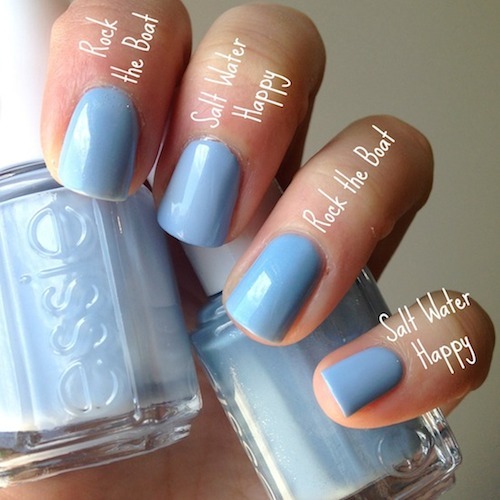 I assumed Salt Water Happy would be quite close to Rock the Boat from Essie's Summer 2013 collection, but didn't own the polish to be able to compare. Last week we visited friends in Winnipeg and one of my followers on Instagram asked if I knew how the two polishes compared. I was lucky and it just so happened my friend Bree owned Rock the Boat AND Salt Water Happy and I was able to do a comparison! 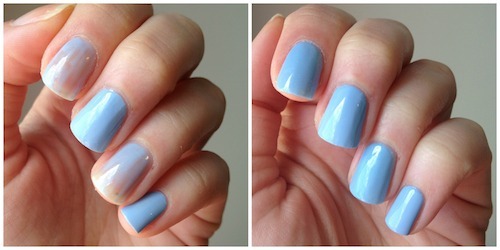 Here in the first pic, Rock the Boat is on my pointer and ring finger. It goes on very, very sheer and watery. Salt Water Happy is on my middle and pinky finger and it was almost opaque on the first coat. 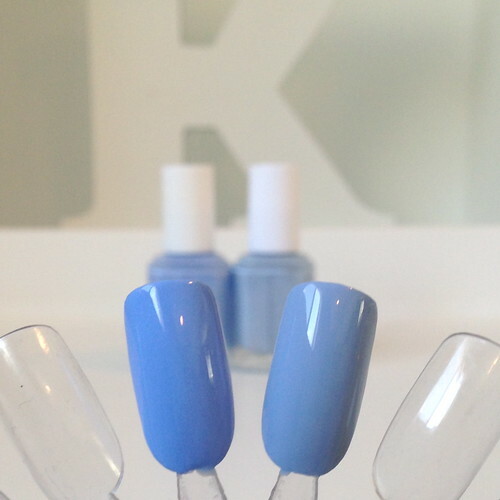 The second pic shows Rock the Boat opaque on THREE coats, while Salt Water Happy was opaque in TWO. 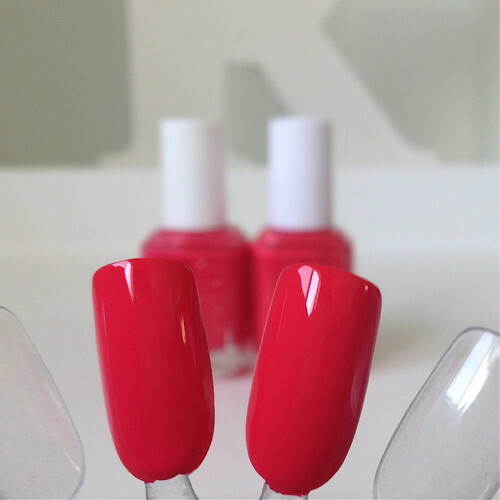 Both polishes look incredibly similar. Rock the Boat has a fine silver shimmer running throughout it, but it's only noticeable if you are up really close. 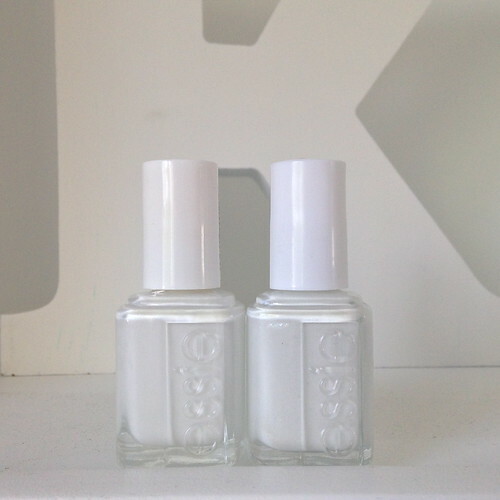 At a fairly normal distance, these two polishes look almost identical. But I much preferred the formula of Salt Water Happy. These two shouldn't actually be as similar looking as they are, what with Private Weekend being infused with shimmer and all, but they totally are. In fact, once on the nail, they look exactly the same. The shimmer in Private Weekend doesn't show up on the nail at all. They apply very differently though. I mentioned before that Private Weekend was quite thick and gritty because of the opacity of the white base and the denseness of the glitter which makes it a bit difficult to apply. 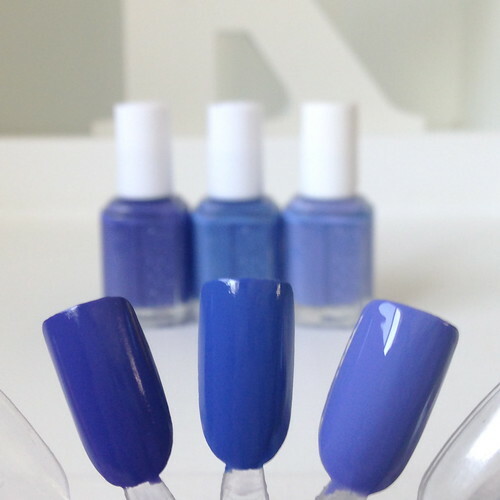 It's opaque in two coats. But what's Blanc's excuse for being such a pain to apply? I didn't own this polish, so I borrowed it from Austrian who told me "good luck" as she handed it to me. She wasn't kidding! 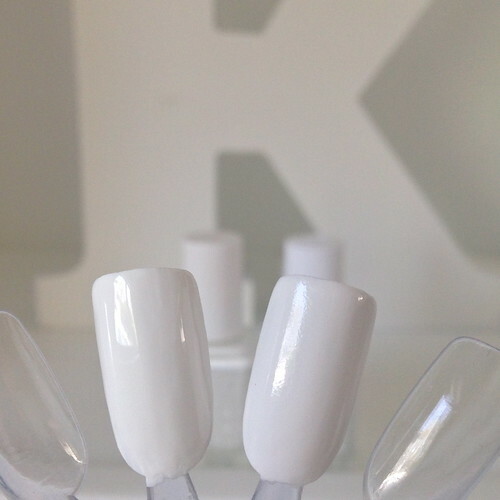 The polish is super thick and opaque and does not go on evenly. It didn't matter how carefully I applied, my nails were lumpy and uneven. 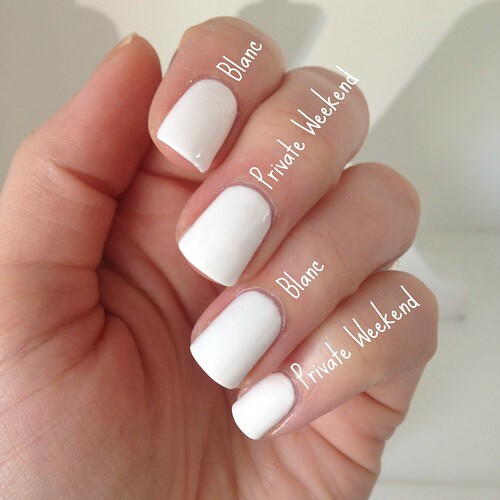 I really hated the formula of Blanc which I hate to say because I know it's an Essie staple, but I really preferred applying Private Weekend. It at least went on smooth. You can see the shimmer in the bottle of Private Weekend but nothing on the nails. 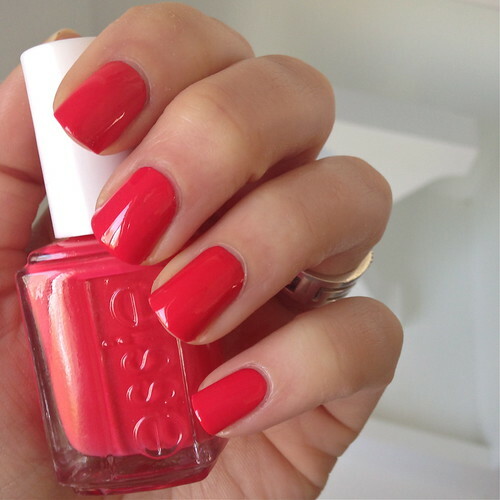 As soon as I tried this gorgeous bright red-coral polish Sunset Sneaks I thought it may be quite similar to Come Here from the Resort 2013 Collection. And I was right. These babies are exact dupes. When I was applying them, after the first coat I made a note that Come Here was slightly lighter than Sunset Sneaks, but after I applied two coats they looked exactly the same. Even application was identical. Both applied super smooth and easy in two coats. If you didn't get Come Here from the Resort 2013 Collection then go ahead and get Sunset Sneaks from this Summer collection. 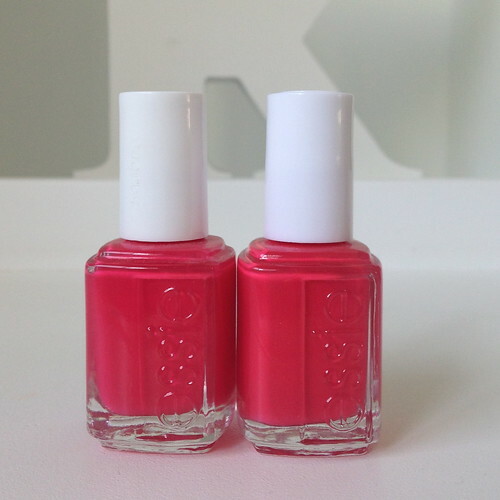 I'm not even sad I own two polishes that are the same because the colour and formula are gorgeous. Now these, you can obviously see, are not dupes for one another, but they were really the closest to Pret a Surfer I could find. It's quite a unique blue in my collection. Suite Retreat leans quite a bit more purple and Boxer Shorts looked similar in the bottle but is lighter and more purple as well. 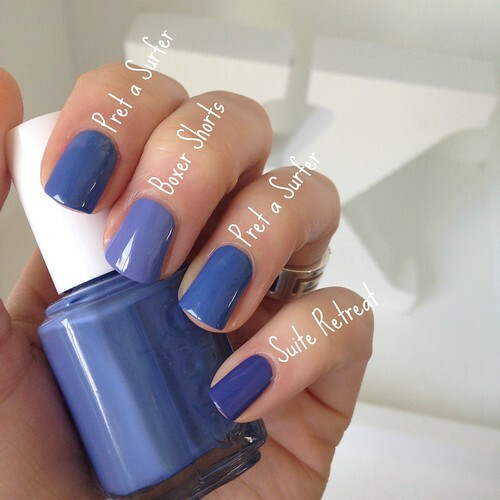 Both Pret a Surfer and Suite Retreat have fantastic, opaque, one-coat formulas. 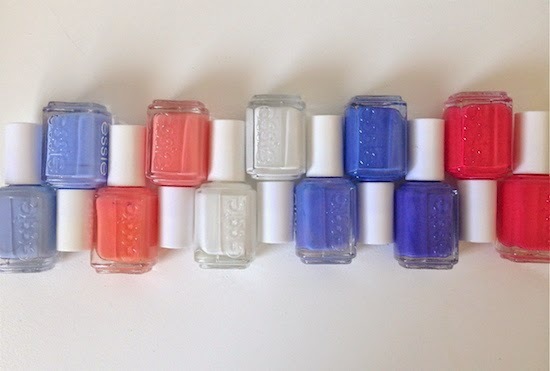 Boxer Shorts has a great creamy formula as well, so you can't go wrong with any of these polishes. I left out any comparisons for Chillato because there's absolutely nothing in my collection like it. Essie's never done a pastel lemon-lime before! I'm still super happy with these Summer Collection polishes. Yes there's a few similar and one dupe but the colours are great and improvements on past favourites. 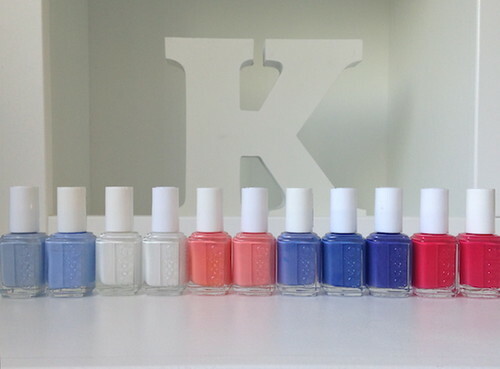 What do you think of the polishes from this collection? Does this make you want to pick any up? Or hold off because you've got some like it already? Thank you for this post! I just bought peache side babe. When I came home, I saw it looked like Tart Deco, so I used google to search for comparison. It's really helpfull you did a comparison for the whole collection, so I can dicide which other one I shall buy. 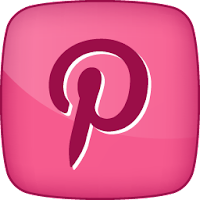 This was a really thorough and helpful post! I was trying to decide if I needed any colours from this collection. I like how to compare the application as well as the colours themselves. Thanks! I'm so glad you guys are finding this post so helpful! Great post! Thanks a bunch!